Jed Palmer - Original Motion Picture Score: Upgrade. Vinyl LP. Bleep. 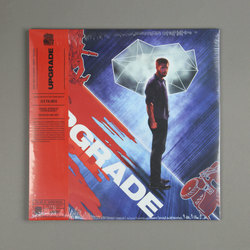 Jed Palmer’s OST for the movie Upgrade finds the composer turning in a set of music that draws on classic cyberpunk tropes in a manner similar to the accompanying on-screen action. Vangelis’ seminal Blade Runner soundtrack is an obvious touchstone, but it’s not all retro-chic thrills here. Indeed, the range of influences on show - dark ambient music, industrial techno, Angelo Badalamenti’s Twin Peaks score - make Palmer’s effort very much an Upgrade on the genre’s previous high-points.